From today (Wednesday 17 January 2018) PASS (Proof of Age Standards Scheme) launches a new design to reflect support from the National Police Chiefs’ Council (NPCC) whose logo is now shown on the cards. The card also displays the logo of the Security Industry Authority (SIA). “Enforcing the law on underage sale is a major policing priority. Lost Passports cause a major problem not only for the owner but for the police should they fall into the hands of criminals. It makes no sense for young people to take these valuable documents into town for a night out. I would like to see PASS used more frequently in the night time economy”. 1. 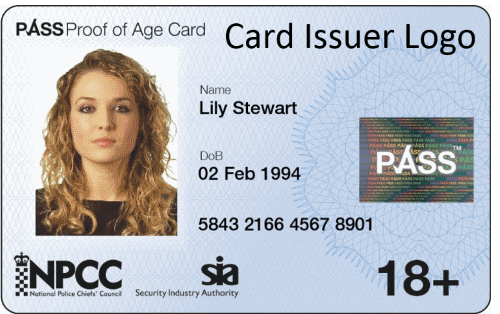 The Proof of Age Standards Scheme (PASS) accredits UK proof of age card issuers to a standard endorsed by the Home Office, Scottish Government, police, security industry, trading standards and retailers of age-restricted goods & services. PASS’s goal is to achieve universal acceptance of cards bearing the trademarked PASS hologram as retailers’ preferred proof of age. 2. 9 card issuers are PASS accredited: 4 UK-wide issuers (CitizenCard, MyIDCard, OneID4U, Validate UK), Scottish issuer Young Scot and 4 English local authorities (Bracknell Forest, Essex, Milton Keynes, Southwark). 3. PASS is supported by six major trade bodies: Association of British Bookmakers, Association of Convenience Stores, Association of Licensed Multiple Retailers, British Beer & Pub Association, British Institute of Innkeeping and the Wine & Spirits Trade Association.